Sports Car Digest Editor Jamie Doyle has assigned me to write a column about the history of sports cars. For the first one, I thought it would be interesting to look at the first events that established motorsports. It’s rather obvious that the first was the invention of the automobile itself. The first motorized vehicles were steam-driven tractors. But the purpose of tractors is not transportation, so they don’t qualify. 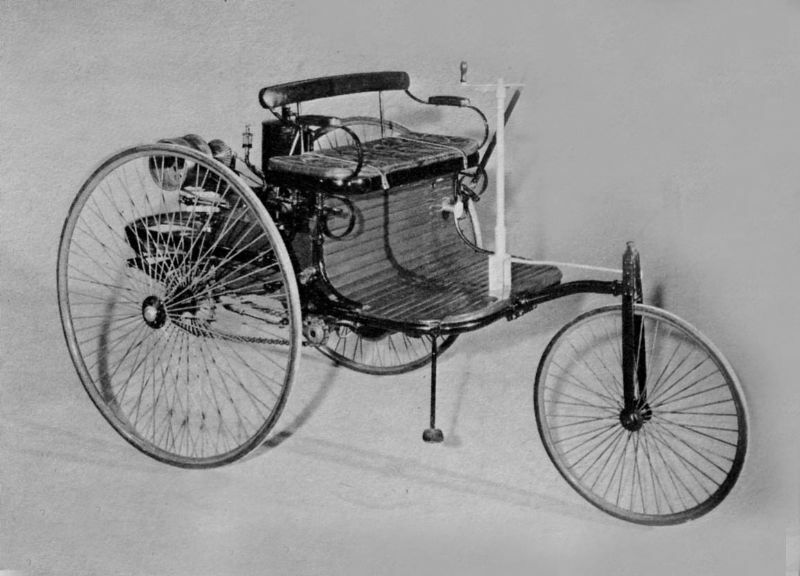 Although there are reservations among some historians, it is generally held that Karl Benz designed and built the first workable car propelled by an internal combustion engine in 1885. But in 1873, Frenchman Amédée Bollée, made a number of experimental steam-powered carriages. His son (of the same name) made a large steam mail coach as well as a smaller steam-driven car in 1885. These were essentially motorization of existing horse-drawn vehicles. Benz’s idea, on the other hand, was to design a then-unique complete unit from scratch whose purpose was to transport people. His first car was a three-wheeler. Power was from a horizontal single-cylinder gasoline-driven water-cooled engine. It developed ¾ horsepower. 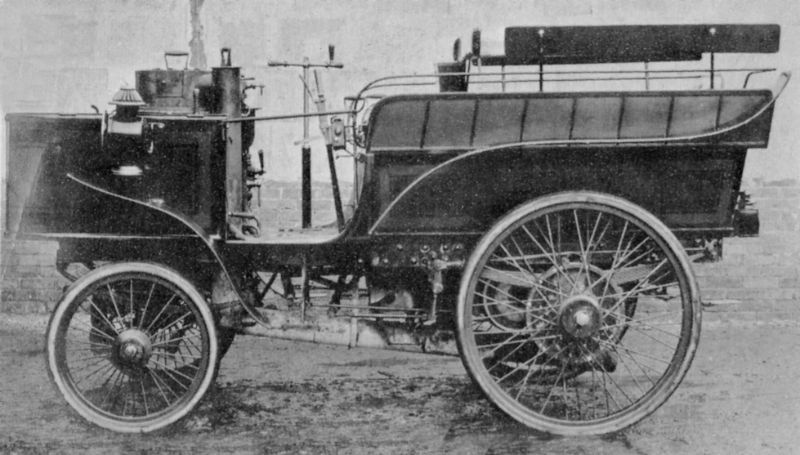 A top speed of 8 mph was recorded during its first trials. Presently it resides in the Deutsches Museum in Munich. The first competition for motorcars took place in France in 1894. It’s interesting to note, however, that the first competition for motorized vehicles for which I have found a record took place between two steam-driven tractors racing Madison to Green Bay, Wisconsin in 1878. The winner took 33 hours and 27 minutes to cover the 201 miles. The State of Wisconsin had promised prize money of $10,000. The legislators however, reneged, claiming that the vehicles were not “a cheap and practical substitute for a horse.” In the end, the State ponied up $5,000. The 1894 race was initially planned as a reliability run between Paris and Rouen. At that time, there were no purpose-built race cars, so the event was for what we would now call production or touring cars. Right from the start, however, the competitors considered the run to be a race. Sixty-nine cars participated in a 50 km preliminary “selection” event. Twenty-five made the cut for the main event of 127 km. Count Jules-Albert de Dion was first with a time of 6 hours and 48 minutes. He averaged 19 km/hr. Second was Georges Lemâitre and then Auguste Doriot third, both in a Peugeot. René Panhard and Emile Levassor in Panhards were fourth and fifth. De Dion, however, was disqualified because his steam-driven car required a stoker which was against the rules. This should have made the official winner to be the Peugeot. The prize, however, was awarded to both Panhard and Peugeot when it was pointed out that the engines in the Peugeots had been supplied by Panhard. The de Dion steam-powered vehicle made the best time at the 1894 Paris to Rouen reliability run. But it was disqualified. 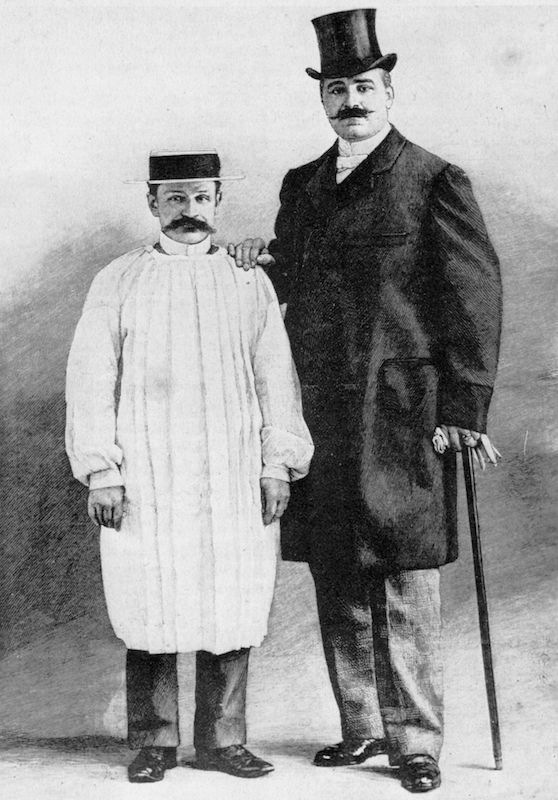 Count Jules-Albert de Dion (right) with his stoker. 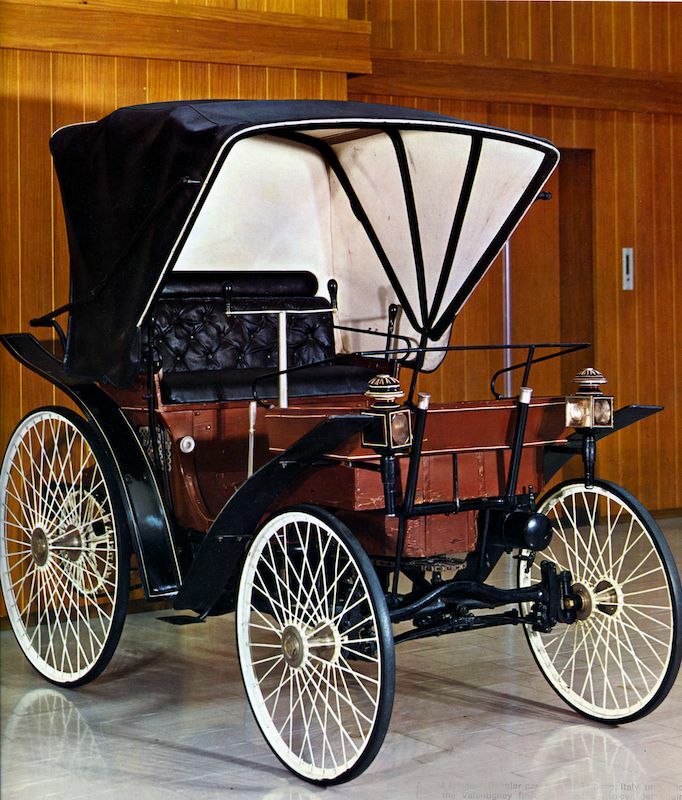 A Peugeot placed second at the first automobile competition in 1894. When the first-place de Dion was disqualified, Peugeot and Panhard were declared the winners. The first race in the U.S. took place on Thanksgiving Day, November 28, 1895, sponsored by the Chicago Times-Herald. The 54-mile course was a round-trip from downtown Chicago to Evanston, Illinois. The roads were covered with snow. Frank Duryea in his Duryea won in just over 10 hours. He averaged 7.3 mph and won $2,000. The Duryea brothers—Charles and Frank—were the first Americans to build a successful commercially-available automobile. In addition to the Duryea, there were two electric cars and three gasoline-driven Benz cars. Although more than 100 cars had entered, only six actually showed up at the start, perhaps due to the heavy snow. The Duryea led off, but experienced a broken steering arm, which Frank was able to fix. In the meantime, a Benz went into the lead until Evanston when Duryea regained first place and held it until the end. The only other car to finish was a Benz driven by Oscar Mueller. The first international series was established by James Gordon Bennett, Jr., owner of the New York Herald. He proposed an annual event put on by automobile clubs of various European countries called the Gordon Bennett Cup. Entrants came from a number of European countries that had national teams. Each could enter three cars, but they had to be made in that country. The teams were distinguished by colors, starting a tradition that has continued to this day. The British were green, with red for Italy, white for Germany and blue for France. There were a total of six Cups races over six years. Most in those days were from city to city. The first Cup took place on May 29, 1900 between Paris and Lyon. Fernand Charron won in a Panhard with a time of nine hours and 23 minutes. Leonce Girardon was second some two hours later. There had been an annual race from Paris to Bordeaux that started in 1895, so it was decided that the 1901 Gordon Bennett would be run in conjunction. 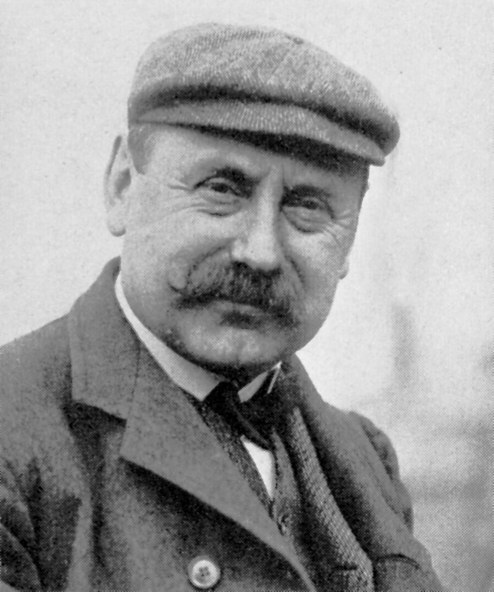 The race itself was won by Henri Fournier driving a Mors. The first Cup finisher was Leonce Girardot in a Panhard some two hours later. Leonce Girardot won the 1901 Gordon Bennett Cup in a Panhard. 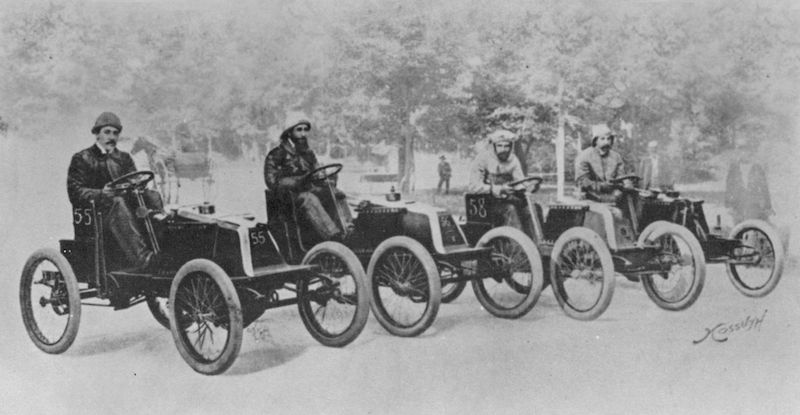 The Renault Team lined up before the start of the 1901 Paris-Bordeaux Race. From left to right: Louis Renault, Marcel Renault, Oury and Grus. The first Gordon Bennett to cross borders traveled the 565 miles from Paris to Innsbruck, Austria in 1902. This time there were only six entries, three French and three British. Two of the British cars were made by Napier & Son of London and fitted with Dunlop tires. Selwin Edge won in a Napier. Because a British entrant had won in 1902, the 1903 Cup would ordinarily have been in England. Racing, however, was illegal on that country’s roads. So the Automobile Club of Great Britain and Ireland selected Ireland as a venue. There was considerable concern, however, regarding safety. Eight people had been killed in the 1901 Paris to Bordeaux and the 1903 Paris to Madrid had to be halted due to many accidents. Because of this, some 7,000 police officers were assisted by troops and club stewards to guard the course. Spectators were kept off the roads and away from corners. Competitors were started at seven minute intervals and had to follow bicycles through each town. The 325-mile race was won by Camille Jenatzy in a Mercedes. Because the 1903 Cup was won by a Mercedes, the 1904 race was held in Germany over a 342-mile four-lap course. Eighteen cars started with Léon Théry of France the winner. The 1905 and the last Gordon Bennett went back to France and took place on a 137 km mountainous course near Clermont-Ferrand. Théry won again. The firsts I have listed here are, of course, among others. If you would like to get in touch with me, email me at agevans@yahoo.com. I appreciate your comments and suggestions. Interesting material. Thanks for your post! Did the AAA racing organization take root and form during this time frame or shortly there after? The photo indicates 1985. Should it be 1885? Indeed it should. And now it does…thanks!